Pattaya floods but new tunnel stays bone dry! 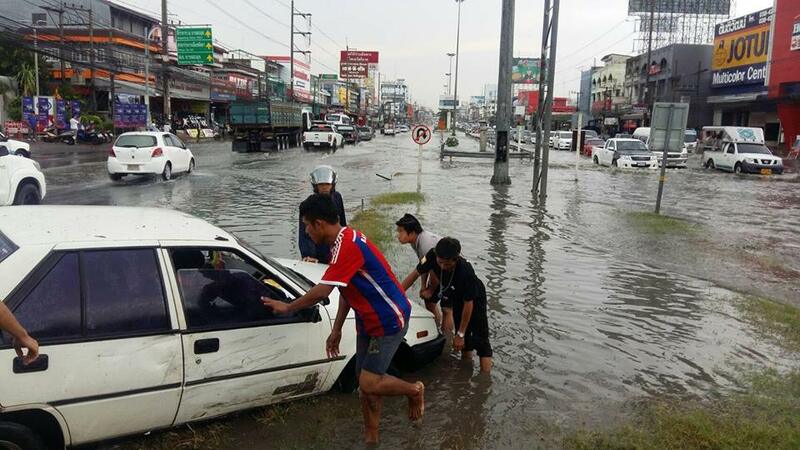 PATTAYA:-- Heavy rain in Pattaya yesterday afternoon caused widespread flooding with many of the usual suspects under up to 50 centimeters of water. But the new underpass that skeptical residents feared would be the first to be submerged in the event of rain came out unscathed. Workers were still busy on the finishing touches to the underpass in dry conditions as the rest of the resort drowned. Some 50 centimeters of water was seen in the Sukhumvit/South Pattaya area and floodwater was also deep on Beach Road and Pattaya Sai 3, reported Pattaya News. One Mitsubishi car got stuck on the central reservation when the driver tried to cross the road to the less flooded other side not realizing that there was a raised portion under the floodwaters. Heavy rain lasted about one hour around 3pm in the afternoon. lol only 50cm, for the tunnel to flood its would have to 5 metres !! Must have been an unintended design fault which caused it not to flood. Yeah they shoulda dug it deeper into the hill. As many here have said all along, hard for it to flood when it's built on a rise. I'm sure it's possible, but just proven it will have to be a big flood for it to happen. Me and my son were having lunch yesterday on Soi Kaonoi when the rain came. We were sat opposite where the current new drainage is being installed. Of course, the flood came down the hill and swamped the works, so on one could tell what was road and what was a 10 foot hole. Two Emergency vehicles turned up and did absolutely nothing as traffic continued to try to get through. One motorbike tried to cross the road and sure enough shot down a hole. The workers had to pull him and the bike out. Two pedestrians then shot down the holes too and also had to be rescued. Of course, the cones warning of the locations of work, washed away. It was very lucky no one was killed, and the road should have been closed as it was very dangerous. Sadly, further down the road, where the new work has been completed was also under water. The new drains are only in the centre of the road, which is cambered, so the water flooded left and right, with the new drainage not helping at all. Total bodge job. One day they will do it properly rather than look for a cheap option, that anyone with a brain can see won't work. I too will be interested to see the new tunnel when we get real rain, rather than a shower. Hope they are not going to complani about lack of water now. 50cm, is that possible? Should it not read 50ml? Looking at the pics I would suggest it was more than 50ml. 50ml is like 4 table spoons, Do you not think there was more than that ? Possibly the 50cm is the depth of water, not the amount that fell from the sky !! Great that it has not flooded yet, pity the surrounding roads were half a meter deep so no one could get the the underpass. once those surrounding roads are 5 meters under water then the tunnel may flood. its amusing all the doomsayers saying it will flood but have obviously not seen the rise in the road up to the tunnel (on both sides). When will the tunnel open ?